A discussion of peregrine falcon conservation in Virginia would not be complete without mention of the falcon pair nesting in the state capitol of Richmond. In 2000, Dominion Power proposed that birds be hacked on the roof of their corporate headquarters in downtown Richmond. 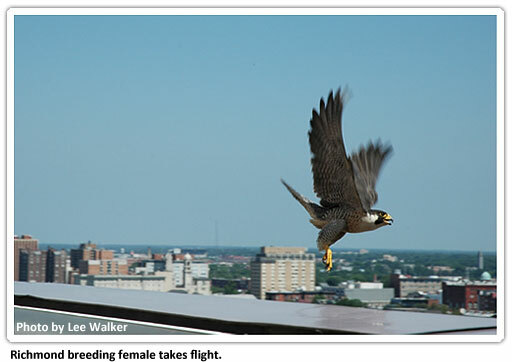 This cooperative effort between Dominion, VDGIF, and CCB led to the hacking of falcons in Richmond for 3 successive years and to the establishment of a pair in 2002. The pair chose as its nesting site the 17th floor ledge of the First National Bank “BB&T” building, and nested there from 2003-2005. Since 2006 the birds have nested on the west tower of the Riverfront Plaza. The pair continues to be productive, having produced 33 eggs and 26 chicks between 2003 and 2010. Fifteen of these have successfully fledged in Richmond. The pair has also contributed chicks to hacking efforts in the mountains, including 2 chicks released at Breaks Interstate Park and 5 at Shenandoah National Park. Two of the Richmond-produced birds have gone on to become breeders in nearby states. A male hatched in 2003 became the new breeder at the Legg Mason Building in Baltimore in 2009. Also in 2009, a Richmond female hacked at Hawksbill Mountain in Shenandoah National Park in 2006 went on to breed on a bridge over the Susquehanna River in Lancaster County, Pennsylvania. Since 2009, VDGIF has coordinated a ‘FledgeWatch’ to monitor the Richmond falcon chicks as they take their first flight from the nest site. The event has seen the participation of local Richmonders who, armed with binoculars and walkie-talkies, aid in tracking the newly fledged birds’ movements for the first few days. The falcons have proven to be popular not only with Richmonders, but with falcon enthusiasts around the nation and the globe, who are able to view live images of the nest through VDGIF’s Richmond Falcon Cam. The pair has certainly kept biologists on their toes throughout the years by switching nest sites on several occasions and by experiencing a nest failure in 2008. These events have been captured through a VDGIF biologist’s blog maintained on the Richmond Falcon Cam site. To view past postings and to keep up with current events involving the pair, follow the link above.